Wood couple with a rose, kissing. Couple with good balance, kissing. Romance is a stereotype of the countries we are visiting: France, Switzerland and Italy. My traveling companion and I were expecting our fair share of middle-aged romance – over a French or Italian meal, or perhaps enjoying a glass of wine by a Swiss lake, or – well, maybe enough said about that. 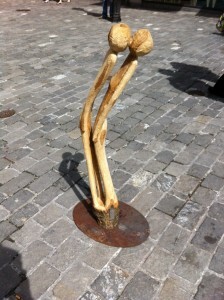 But I don’t think we were expecting to find romance carved in wood on the streets of a Swiss town. 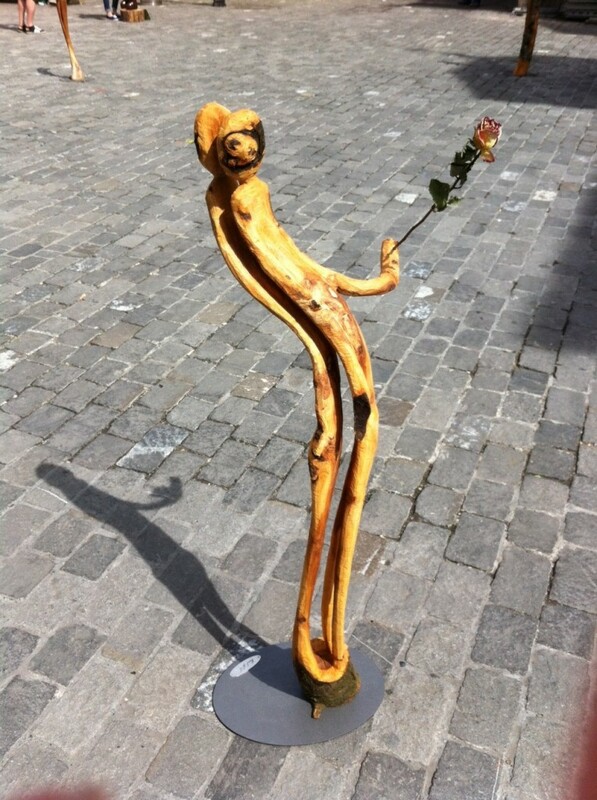 But in the middle of Luzern we found a display of wooden sculpture, most of them couples kissing – notably thinner couples than my traveling companion and me and certainly more flexible. One or both of us would surely topple if we kissed bending over so far. 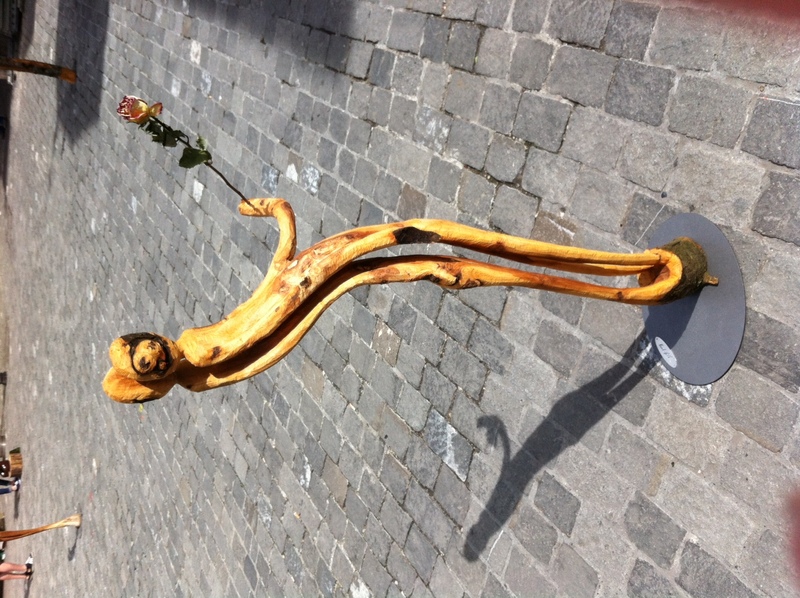 Perhaps our inability to embrace with such balance enhanced our enjoyment of the sculpture display on the cobblestone streets of a Luzern intersection. I lingered among the statues shooting pictures as my companion shopped for shoes. 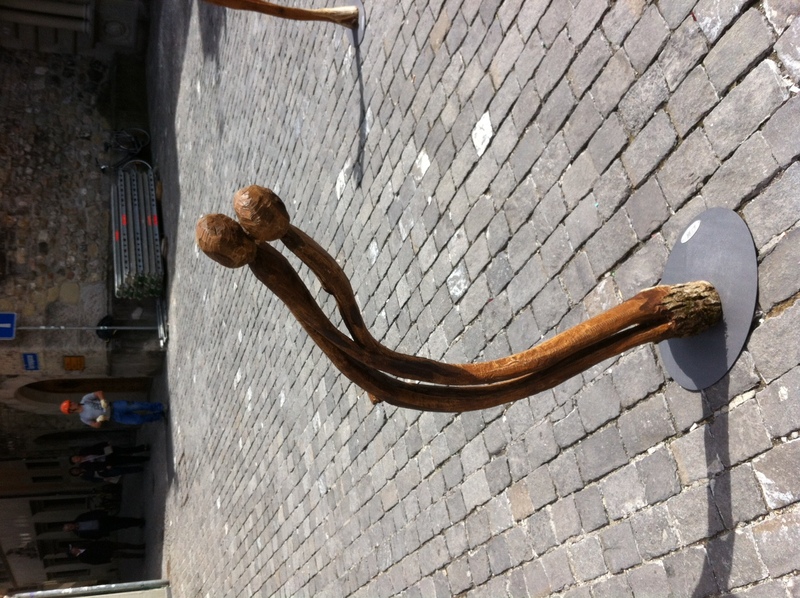 I thought it might be fun to ask someone to shoot a photo of us kissing – vertically – among the sculptures. But we’re vain enough and round enough that we each prefer photos of the other or just of the places we visit. 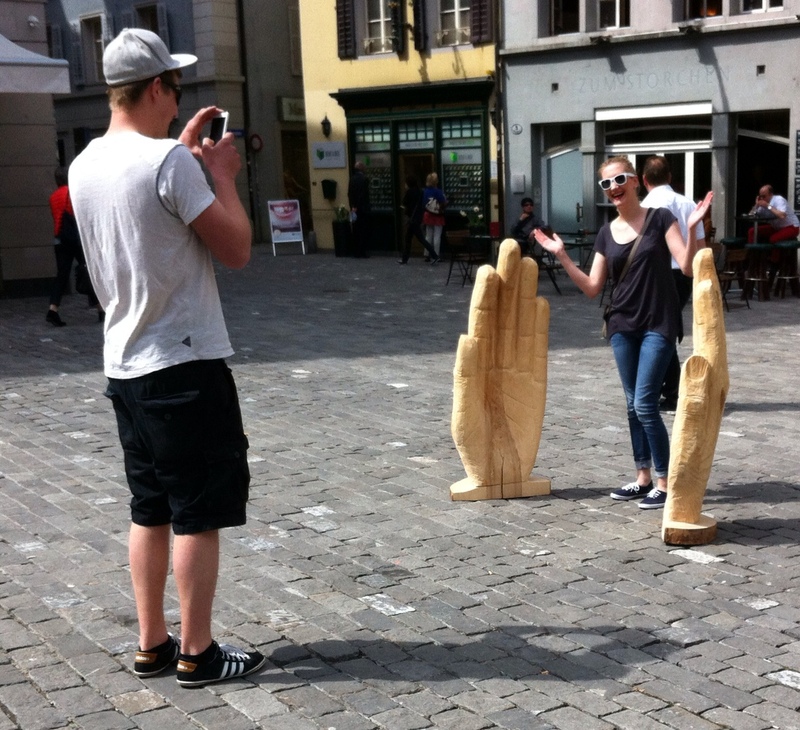 I also needed someone to stand between the large wooden hands, to provide some perspective. But we’ve been traveling together long enough that I knew better than to interrupt shoe shopping. 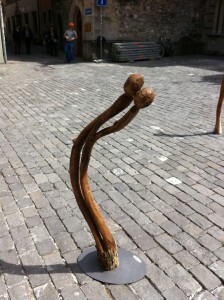 Then a young couple strolled into the sculptures, enjoying them as a young, romantic couple should. I was too slow with my camera to catch a picture of him shooting a picture of her kissing a sculpture of a man. But then he posed her between the hands and I had my romantic shot in the sculpture display. This entry was posted in Uncategorized by stevebuttry. Bookmark the permalink.